I’m 7 years old and since my owner adopted me a year ago have NEVER had an accident inside. Today, I peed on my second favorite human’s boots… while she was wearing them and standing on the carpet at work. I was also very well hydrated today. Posted July 29th, 2013 . Poor baby does look sorry. Love the blank stare of the guilty dog. Escape to some happy place in your mind, poochie, instead of focusing on being shamed! She looks so sweet – probably had to go and didn’t know where the door was. 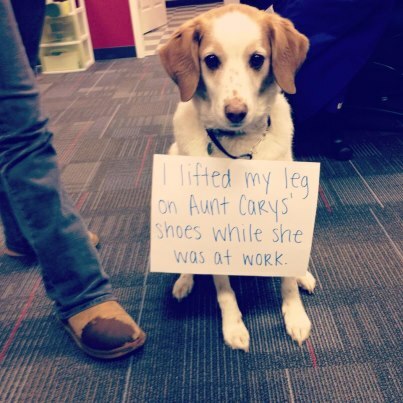 I work where people can bring dogs in, and they are known to act in ways that surprise their owners. At least she didn’t throw up on you right before a big meeting like someone I know had happen to her at work.